Sometimes you come too close for comfort. 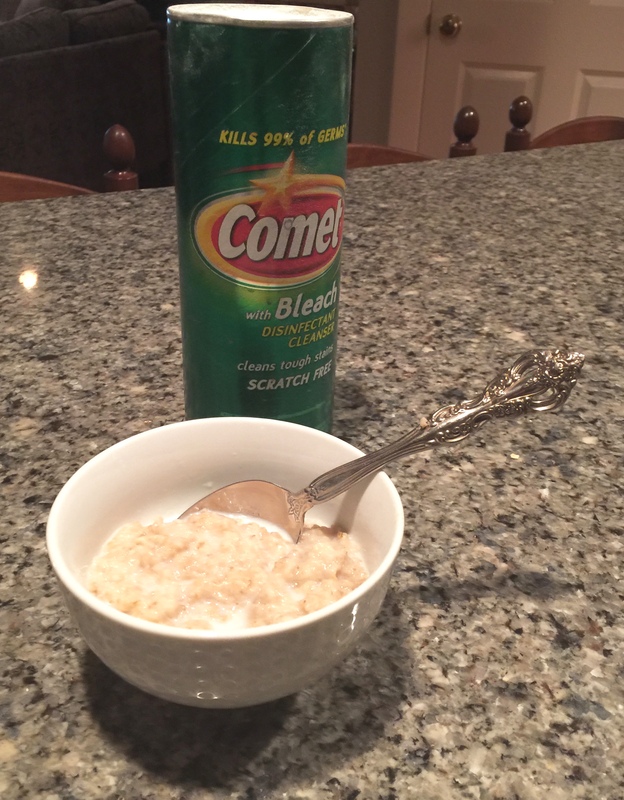 For sure I did that day I picked up a can of Comet and started shaking its contents onto my oatmeal. You know that creepy all-over tingle you get when you almost fall down a flight of stairs? It felt like that. And it felt like that again the very next day, when I gunned my car in the driveway and nearly backed into the spanking new vehicle parked directly behind me, a vehicle that visiting friends had just two minutes before proudly pointed out to me from my kitchen window. That time I actually started hearing things: a kind of tinny high-pitched taunting tune, like the one the maddening little monsters in the film Gremlins sing outside poor Mrs. Deagle’s house. So I do have to ask myself: What makes people like me lose their bearings this way? I don’t think it’s the “task” in multitasking that does it. It isn’t so much what we’re actually doing with the many spider-arms we seem to think we possess, but rather what we’re thinking. So many of us get trapped on that to-do-list carousel, going round and round, reaching for that brass ring that keeps reappearing with every circuit. I think of Sisyphus, fated by the gods to push the same giant boulder up the same hill every day, only to see it roll back down again. 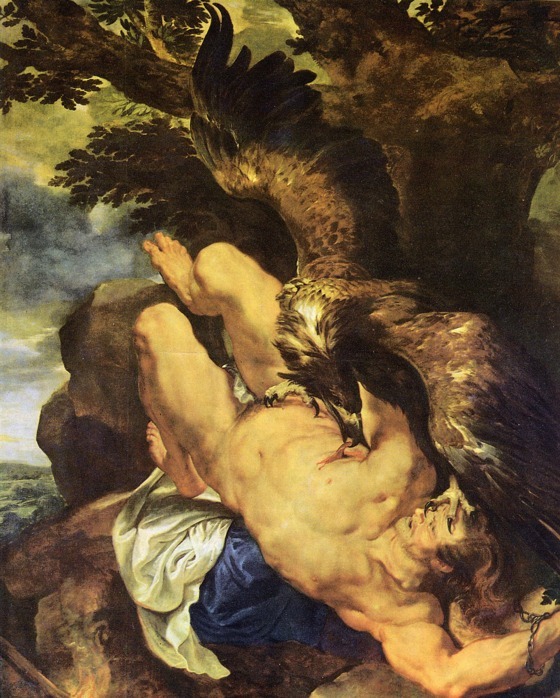 I think of Prometheus, chained to a rock while an eagle plucked his liver out every day – only to have it grow back again, only to have it plucked out again, etc. But it’s not just the repetitiveness of our daily chores that has us sprinkling powdered poison onto our cereal or backing our cars into other people’s cars. It’s the assault from outside of us. Once it was just TV commercials, radio ads and billboard messages that we had to tune out. Now, the busy chatter is coming at us from a place far closer. I’m talking about the place inside our pockets. I’m talking about the spot right next to us, while we sleep. I’m talking about the smart phone and all those chimes and dings and hiccups it keeps emitting unless we reach deep into its “Settings” belly and gag it entirely. I myself, for example, am instantly notified by my college every time the place does something it thinks is cool. I’m notified by NOAA every time there’s a storm brewing three states away. I’m notified about any and all criminal trials deemed to be of such interest to the public that bulletins go out every time the Defense rests, every time the members of the Prosecution, prepare to question the witness, rising and buttoning their suit jackets the way everyone is always doing on The Good Wife. I know it’s my fault. I did, after all, sign up for these notifications, so it’s on me if I get overwhelmed by the unstoppably pouring spout of them. Still, I can’t help thinking of that first phone call in history call made by Alexander Graham Bell to his assistant several rooms away. “Mr. Watson, Come Here, I Want You!” he shouted into the mouthpiece. These days everybody wants us. The challenge is to remember that with the exception of the good safety-minded people at NOAA, really, they only want us so they can sell us stuff. Maybe people are just stressing out and that’s why they send along nasty demeaning emails, like the ones I was talking about here on Monday. Maybe stress is also responsible for the curmudgeonly ways of that crotchety shopkeeper I told about Tuesday. A documentary dealing with stress and what stress does to our kids was screened in my town the night before last. I couldn’t go see it because I was three towns away getting sweetly peed upon by a naked baby just now learning to sit upright, which is what she was doing, on my lap , while the two of us watched the soapy fun her brother was having in the tub. Still, I honored the event in my own way yesterday morning, when I looked up the documentary on Google and watched its every trailer and clip, the coverage the New York Times gave it the interview Katie Couric did with Vicki Abeles who made it – everything I could find about it on the Internet in short. 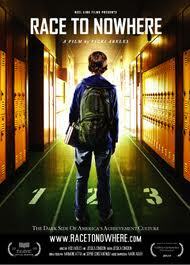 In Race to Nowhere as director Abeles has chosen to call her film, we get a look at all the must-do’s in our public schools, from the hours of assigned homework to the introduction of the high stakes testing that came on the scene with the No Child Left Behind program inaugurated by the previous President George W Bush. A chief point made in the documentary is that the so-called “high ability” kids are so pushed to achieve that many are nearing the breaking point, even as other students, who do not do well on standardized tests, are growing discouraged by their results on these standardized tests and dropping out of school at a much higher rate than in the years before this program was implemented. Additionally most educators agree that when you merely “teach to the test,” working to prepare students for a single exam that will be used to label the teachers and the school system AND the students, you drain all spontaneity and creative ferment out of the classroom. Maybe you’ll agree with the film’s thesis and maybe you won’t but one thing is sure: with adults in this society exhibiting the levels of stress that they do the last thins we need it to be inflicting more stress on our children. As the Mayo Clinic’s website puts it, ““When the stressors of your life are always present, leaving you constantly feeling stressed, tense, nervous or on edge, that fight-or-flight reaction stays turned on. The less control you have over potentially stress-inducing events and the more uncertainty they create, the more likely you are to feel stressed. The long-term activation of the stress-response system — and the subsequent overexposure to cortisol and other stress hormones — can disrupt almost all your body’s processes. This puts you at increased risk of numerous health problems, including heart disease, sleep problems, depression, obesity, memory impairment…” And that’s just a partial list. Watch the clip now and see what you think.